The Carbon Capture Coalition brings together energy and industrial technology companies, labor unions, and energy and environmental policy organizations. Its goal is to make carbon capture, use and storage (CCUS) a widely available, cost-effective, and rapidly scalable solution to reduce carbon emissions to meet mid-century climate goals. The coalition, launched in 2011, has built bipartisan support at the state and federal level for pragmatic policies to accelerate CCUS and boost U.S. energy infrastructure development, create jobs, and cut carbon emissions from both the power and industrial sectors. In February 2018, Congress enacted a two-year budget deal which extended and expanded key financial incentives for investment in several advanced low-carbon technologies. The budget deal included the FUTURE Act, legislation sponsored by Senators Heidi Heitkamp (D-N.D.), Shelley Moore Capito (R-W.Va.), Sheldon Whitehouse (D-R.I.), and John Barrasso (R-Wyo.) to reform and extend the Section 45Q tax credit to boost carbon capture. The FUTURE Act also allows for the first time use of the tax credit for capture of carbon monoxide from industrial facilities like steel production, direct air capture of CO2 from the atmosphere and for the conversion of captured carbon into useful products. 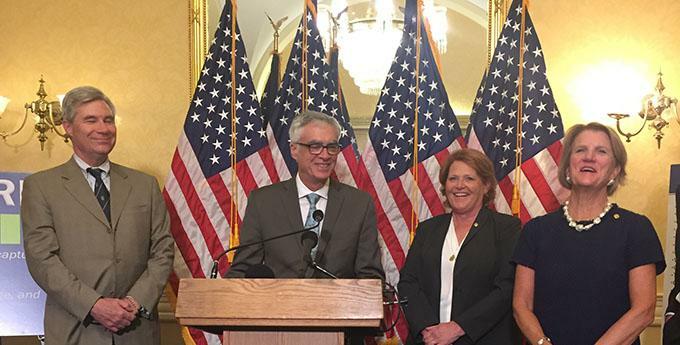 From left to right, Sen. Sheldon Whitehouse (D-R.I.), C2ES President Bob Perciasepe, Sen. Heidi Heitkamp (D-N.D.), and Sen. Shelley Moore Capito (R-W.Va.) speak at the introduction of a Senate bill to increase incentives for carbon capture projects. Working with governors, state policymakers and local stakeholders to support deployment of carbon capture, pipeline infrastructure, and CO2 utilization and storage projects around the country. The Carbon Capture Coalition is co-convened by the Center for Climate and Energy Solutions (C2ES) and the Great Plains Institute (GPI). See a list of Carbon Capture Coalition participants.